The Curse of Nineveh is a seven-part campaign for Call of Cthulhu set in London, in the summer of 1925. The investigators find themselves embroiled in the events that surround the return of an expedition from Nineveh and a terrible curse that they brought back with them. All of the color drains from Henry's face as he surveys the blood spattered room. turning back to the group he says, "I did not want to believe it, but the more bodies we see the more evidence there is for the creature that Mr. Laine described. Looking at all the blood here in this room, it's more than would normally be found in a human body. I think that perhaps the precedence of morphine in the dead man's system made this creature sick, and then it vomited blood into the room." Cynthia winces at the doctor's description. Is...is there anything else in there?" she manages. "The... creature? Do you mean there really is a... a monster! On this boat! ", Father Mason looks around with uncertainty and fear, "We need to leave right now". "That's an excellent idea, Padre," Tommy says with a touch of dark sarcasm. "Any idea how?" He wouldn't normally be rude to a clergyman, but his nerves are on edge. "Anyway, I think this 'monster' is as human as you or I. We've got to keep looking. You blokes with guns, keep 'em ready." With that he moves cautiously to the nearest unexplored room. Cynthia unlocks the cabin with her key and stands back, her pistol in her hand. The door to this cabin is unlocked. The bed is rumpled and a man’s clothes are strewn about the room. even a casual look at the bed linen, means the investigators will quickly realise how the occupant of the cabin spent part of his evening. "Anybody wants to search this place, go ahead. I'm heading for the next one." Tommy approaches it, crowbar in hand. Cynthia shakes her head and follows Tommy to the next door, key and pistol at the ready. The cabin is unlocked. Inside are the belongings of James Neville and Alfred Prebble. Neville’s clothes are still packed in his suitcase. Two dozen love letters addressed to Violet Gibbs-Woolf declaring Neville’s love in the most painful purple prose. None of them have been posted. By contrast, Alfred Prebble’s possessions are placed neatly in the wardrobe and chest of drawers. There is a telegram in a small leather writing case. It reads: “Death is nothing at all. 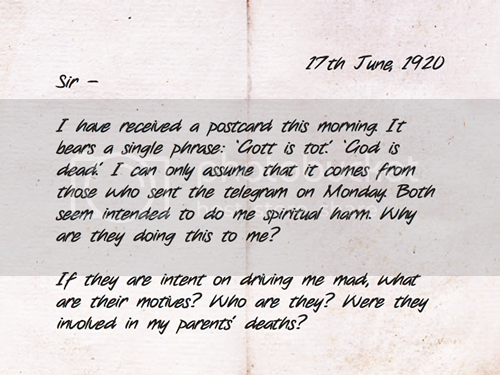 For that reason you should fear it.” It is dated 14th June 1920. Its place of origin is indecipherable. A letter, half-written, is folded underneath it. "That poor man," says Cynthia, examining the letter. "I recognize this phrase. It's a quote from Friedrich Nietzsche, a German philosopher." "Sounds like a bunch of Reds behind this," Tommy observes. "Anarchists. We better be prepared for anything. Let's keep looking." Cynthia nods and proceeds with him to the next cabin. "The people harassing Mr. Prebble don't sound like the insane ramblings of the hijackers", Henry says thinking out loud. Father Mason shakes his head as he reads the letter: "Mr. Prebble came to me earlier, he was deeply troubled. Honestly, I thought he was blowing things out of proportion", he exhales sharply before continuing, "And look where we are now. It looks like age only made me weaker, not wiser". The door is unlocked. In addition to the usual furnishings and the personal effects of two male guests, investigators will find a Christie’s catalogue on one of the nightstands. A bookmark is inserted in the section on rare books.The auction is set for Thursday 24th June and two volumes have been circled in green ink. the second is purported to be an Anglo Saxon translation of the Liber Pullus, the lost Book of Sorrows of Roman origin. reveals the bookmark to be a strip of 15th century parchment. the cabin belongs to Victor Fairchild and Walter Humphries from their personal effects. The less expensive suitcase, which belongs to Walter Humphries, contains a loose-leaf folder. It is tied with what appears to be a strip of snakeskin and is bursting with jottings, notes, and diagrams, written in an unfamiliar language in what appears to be a frenzied hand. identifies the language as futhorc. "This stuff doesn't look important," Tommy says impatiently. "Let's keep going." "It's beyond me," says Cynthia, looking around, "and I know quite a bit. I wouldn't go so far as to say it's not important, though. Maybe this is connected to why those crazy people are doing this. Rare books always interest me in any case." "It appears that Mr. Humphries here is a study of ancient history", Henry says holding up the writings fro the suitcase. "Unless I'm mistaken this is from an old runic script called Futhorc." OOC: Do we have any way of translating the writings or is identifying it the best we can do for now? Father Mason looks with critical eye at the new discoveries: "The bookmark... is 15th century parchement. Quite curious for a bookmark, wouldn't you say? I wonder if there's more to it. Regarding the runic script, I'm afraid I can't be of help. My knowledge only goes as far as Latin and Greek". OOC: Is there anything written on the bookmark? Only made this roll since Henry already succeeded in the other two.